No Registration Fee for ASA Members, but you MUST REGISTER TO ATTEND! Strengthen your capacity as a leader and influencer through a group experience at the National Strength and Conditioning Association. You will learn how to recognize how physical activity enhances your cognitive performance, and you will be exposed to the latest research and practical tips related to not only fitness, but everyday habits you and your staff can incorporate to improve stress management and sleep quality. Included in this workshop is a hand-on session at NSCA's state-of-the-art Performance Center where you'll learn easy-to-perform stretches and body weight exercises (don't worry, all activities will be appropriate for people of all abilities and level of fitness!). Dress comfortably! Hotel shuttle will provide transportation. Association Charrette brings together industry thought leaders to challenge each other and the status quo to strengthen and advance the association profession. Association Charrette is designed to be a truly immersive experience. Expect deep, insightful conversation about emerging trends and disruptions, as well as professional growth opportunities. Association Charrette is not a presentation, but a co-creation of the participants in which we will work together to discuss topics of interest to our state societies and ASA. This will include Mastermind groups that will discuss specific challenges or opportunities in smaller groups. Personal impact. Thought Leadership. Stronger together. Association Charrette. Please plan to arrive sometime in the afternoon/evening (earlier if you would like to participate in the pre-event session with Scott Douglas) on Sunday 1/27, and make your plans to fly out no earlier than mid-afternoon or evening on Tuesday 1/29. Rate: $89.00/night. Rate is available 2 days pre and post based on availability. 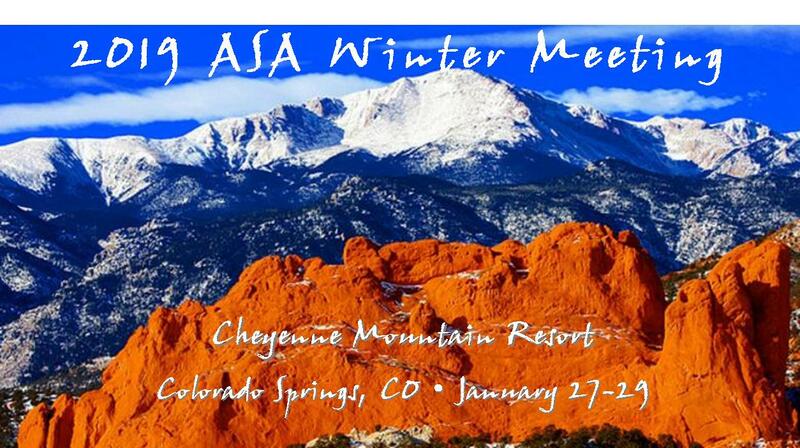 While there is no fee for ASA members to attend the Winter Meeting, you are required to register by 1/7/2019. Registration coming soon!